Hosting a film can be a unique way to celebrate a milestone occasion (graduation, anniversary, birthday) or honor the memory of someone special. It makes a thoughtful gift. 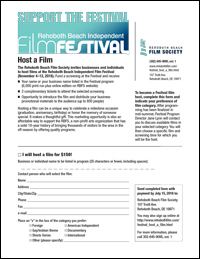 This marketing opportunity is also an affordable way to support the RBFS, a non-profit arts organization that has a solid 20-year history of bringing thousands of visitors to the area in the off-season by offering quality programs. Please click here for the Host a Film form.